I've been looking at Scandanavian and Japanese wood toys for style inspiration. 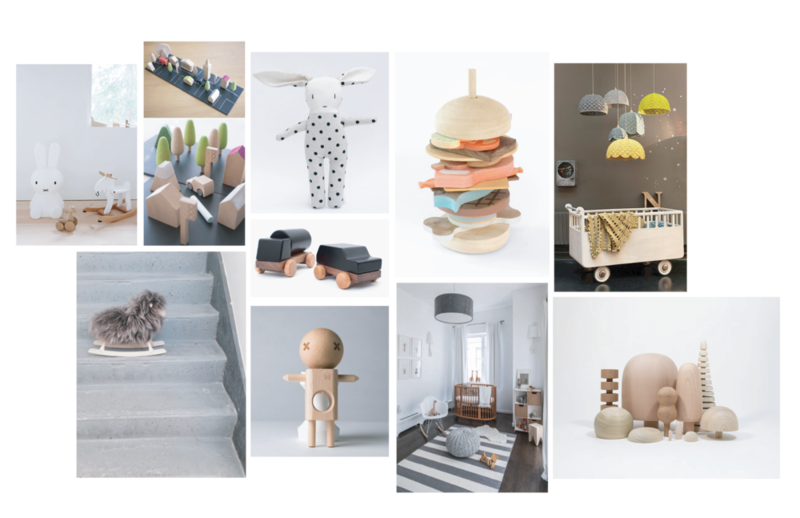 They do gender-neutral colors/materials very well, and I enjoy the calm elegance of their toys. I've also been looking at other wooden toy cars out in the market. Now that the insides work, a lot of my work lately has been spent on designing the outsides. It's been difficult, to say the least, because for a while I felt like I was just designing a car. I'm pretty torn up about it being a car at all. I'm incredibly rusty on my drawing skills and it took me a while to get back into the swing of things - especially thinking in three dimensions again. I made some blue foam models to figure out what I can do within my sizing constraints. Note how much of the Marc Newson car I accidentally made! I still have a lot of ironing out to do. After some reflection, I wanted to get rid of the app completely because at this point it feels very disconnected to my toy. Not to mention, I haven't even touched it. I think I wanted to do the app because it was an easy solution of translating the music on the track to actual music, but I'm almost afraid that it's a cop out. I'm trying out the idea of having pre-made songs on pieces of paper you lay over the track and create music off of those guides. Maybe even another clear layer that can show harmony options in relation to the melody. I also need to really nail down the form. I definitely agree that it doesn't have to be a car or a truck or a train or anything remotely vehicular. What I'm struggling with is how to depart from that and where to go in terms of the amount of abstraction I should deal with. It's no longer a "musical car" but a musical... vehicle?